Black Friday Gun Background Checks Reportedly Soar To Record High : The Two-Way The FBI says it fielded 203,086 background check requests for gun purchases on the day after Thanksgiving. 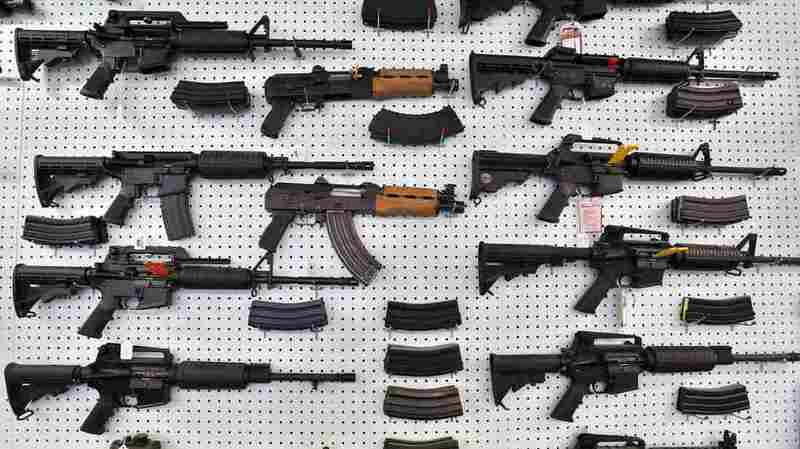 Guns are displayed at Dragonman's, an arms seller east of Colorado Springs, Colo.
"Background checks are considered the best available proxy for gun purchases since overall sales numbers are not made public," reports NPR's Uri Berliner. 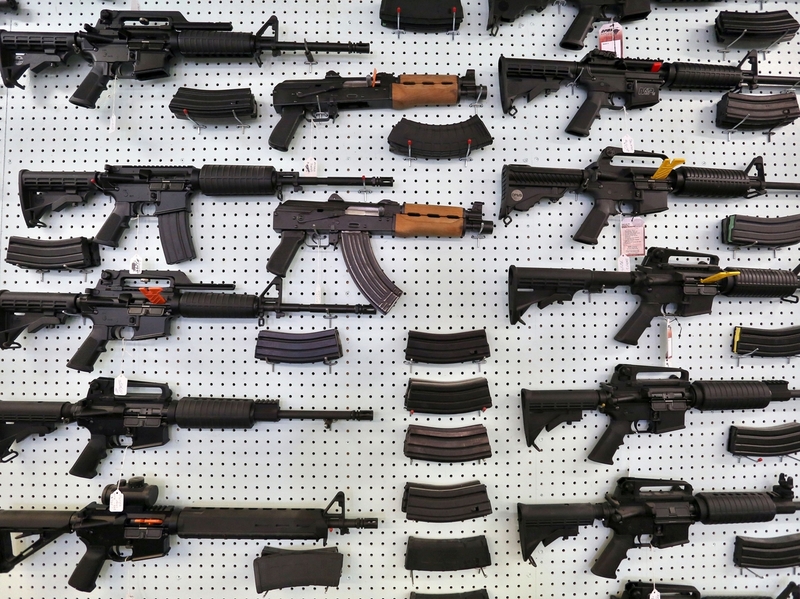 But the number of firearms actually sold on Friday was probably higher than 203,086 because a buyer would require just one check but could purchase multiple firearms in a single transaction. It is a popular time of year to buy guns. The previous record of 185,713 background checks was set one year earlier on Black Friday. The National Instant Criminal Background Check System is designed to keep guns from falling "into the wrong hands," according to the FBI, although the reality sometimes falls short of the goal. Federal law bars convicted felons or anyone under a domestic violence protective order from owning a firearm, among other people. The FBI says out of the more than 230 million checks that have been conducted, more than a million denials have been issued. The agency also says the system "ensures the timely transfer of firearms to eligible gun buyers." In the vast majority of cases, the background check takes just a couple of minutes, and if it comes out clean, the buyer walks away with the weapon, reports The Wall Street Journal, citing FBI data. But even if there is a holdup, the consumer may still be able to get the gun promptly. "In about 8% of cases, the verdict is delayed, and the seller has to wait three days. If there is no verdict after three days, the sale can go through," reports the newspaper. Another loophole: only federally-licensed firearm dealers require background checks. Consumers can get around the rule by making a legal purchase from unlicensed sellers. Friday's surge in background check requests came two days after Attorney General Jeff Sessions directed the FBI and the Bureau of Alcohol, Tobacco, Firearms and Explosives (ATF) to do a comprehensive review of the National Instant Criminal Background Check System (NICS). "The recent shooting in Sutherland Springs, Texas revealed that relevant information may not be getting reported to the NICS – this is alarming and it is unacceptable," Sessions said in a statement. The gunman who killed 26 people at the First Baptist Church earlier this month should never have been carrying a gun. He was legally barred from possessing a firearm after being convicted of assaulting his then-wife and baby stepson, while serving in the Air Force. But the system apparently fell short of flagging him. Air Force spokesperson Ann Stefanek told The Two-Way in an email, "Initial information indicates that Kelley's domestic violence offense was not entered into the National Criminal Information Center database by the Holloman Air Force Base Office of Special Investigations." But the system has been struggling under the weight of an exponential increase in background checks in recent years. In 1998, NICS reported fewer than 1 million. By last year, it had conducted more than 27 million — a record. "The mere record of arrest is not enough to prohibit a gun sale, so FBI analysts must race to fill such information gaps within the three-day time period allotted for each check. The search sometimes requires inquiries to police departments, courthouses and prisons across the country to match final dispositions to the incomplete records." Despite the rise in firearm sales in recent years, President Trump — who is backed by the National Rifle Association — seems to have actually been bad for gun business. Since his election, the number of background checks dipped down, following a surge in 2016 amid fears that a Hillary Clinton presidency might limit gun sales.